Since the mid-19th century there has been a periodic interrelationship between the movements for African emancipation and women’s liberation. Of course these convergences have not been without serious contradictions particularly in light of the historic racial and class divisions which became characteristic of United States society as a whole. Quite similar to aspects of the labor movement which sought to exclude African people from whatever advancements were made in regard to better salaries and working conditions, some sections of the white-dominated women’s suffrage movement sought to align themselves on the basis of race while relegating African American women and men to the doldrums of lower caste status through a permanent state of second-class citizenship. Ironically in many ways, the origins of the women’s suffrage movement were spawned by abolitionism, the struggle to eliminate the legal basis for the enslavement of African people. 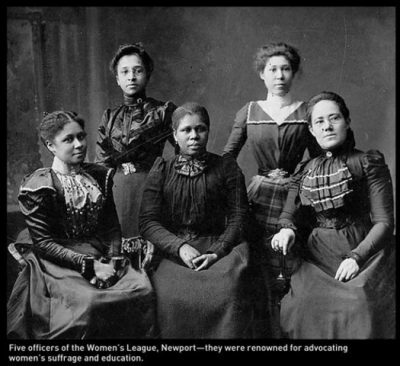 Nonetheless, the question as to whether European American women were prepared to take a principled stand against racism and in favor of the liberation of African people remained elusive. During the 1830s, the abolitionist movement in the U.S. included the pivotal participation of women who often campaigned against slavery. At this time even white women were considered subordinate to their men and were even prohibited from speaking publically. 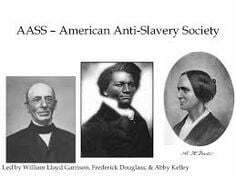 Yet several prominent women in the abolitionist movement in the U.S. attended. 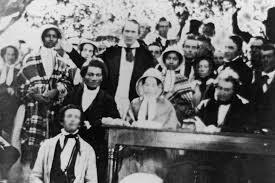 The first day of the Convention was pre-occupied with the question of whether women could speak at the gathering. Eventually it was decided that women would not be allowed to speak or vote while they were relegated to a separate section of the hall. The aftermath of the London Convention would prompt figures such as Lucretia Mott and Elizabeth Cady Stanton to work towards the convening of women’s rights conferences. The NWSA, largely led by Elizabeth Cady Stanton and Susan Anthony, refused to support the 15th Amendment if another measure was not introduced and approved guaranteeing suffrage for women. Opposition to the 15th Amendment led Stanton and Anthony to seek support from the previously pro-slavery Democratic Party. In Kansas during a campaign to secure women’s suffrage, they coalesced with George Francis Train a railroad magnate who spoke openly about his believes that African Americans were inferior, saying that it would be an outrage for Blacks to gain the franchise prior to European American women. Train would finance some of the work of Stanton and Anthony during the late 1860s and early 1870s causing much consternation among African Americans and supporters of the 15th Amendment. This rift in the European American women’s movement would remain until the conclusion of the 19th century when there was a renewed thrust towards universal suffrage resulting in the merging of the two factions creating the National American Woman Suffrage Association (NAWSA). Voting rights were granted to women in several states prior to the passage and ratification of the 19th Amendment in 1920. Racist violence was rampant in the North, South and other regions of the U.S. It would take a series of legal challenges and a mass movement to win equal rights for African Americans by the conclusion of the 1960s. The 1965 Voting Rights Act provided opportunities for African Americans to vote in the South leading to the increase in the number of Black elected officials throughout the country. After the advent of the African American led Civil Rights and Black Power campaigns between the 1950s through the 1970s, the women’s movement experienced a revival. However, divisions remained over race and class with white women advancing in some sectors of the labor market due to the continuing national oppression of African Americans and other people of color. Lessons from the 19th century anti-slavery and women’s movements portend much for the ongoing problems of race and gender in the present period. Until the basis for inequality is eliminated these contradictions can easily be utilized by the capitalist ruling class in the U.S. as a mechanism to foster divisions among the working class and nationally oppressed.